On an offworld asteroid, a red fire wipes the sky as headquarters explodes! Hostile alien forces have invaded the vital subterranean mining colony. The operation is blown sky high. Workers are trapped in crevices and chasms, helpless against the clouds of radioactive dust swirling toward them! Take control of the experimental attack fighter, the only weapon even remotely powerful enough to repel the alien attack. Begin each mission from a combat base. Return to base with "MISSION ACCOMPLISHED" or count yourself a failure. Pick up special weapons, fuel and shield recharges. Don't expect much help. Your one-of-a-kind fighter is still in the research stage. Indispensable equipment will be delivered to every area, but you have to find it! Before you enter a stage, Mission Control will contact you via satellite. You'll see the Mission Report screen, which displays a stage map, a readout of your mission orders, verified data, suppositions about the combat situation, and strategy when available. Study the map and read the reports carefully; they contain vital information. You must begin and end the mission at the combat base and fulfill all mission orders to clear the area and advance. --From the Genesis Sub Terrania instruction manual. �����You are going where no man has gone before! Space, the Final Frontier? No, into a dirty mine inhabited by dirty aliens. No, Kirk and Picard get to flirt with beautiful aliens while you are somewhere crawling around in the dirt. And if that weren�t bad enough, you are looking for parts to upgrade your vehicle to be sub-aquatic. I guess some aliens must be hiding in a sewer somewhere. 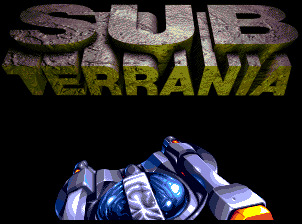 �����Sub Terrania requires extremely skilled hand-eye coordination. It definitely is not for a novice gamer. However, the designers were well aware of this and have provided a training screen at the beginning of the game called �Controls�. If you are a newbie, go there and gain some experience. You will need it. �����The designers also added a little something that most of us are unaccustomed to in games: gravity. Stop moving and you begin to fall. Of course this does allow you to conserve fuel if you are going downward anyway. But it can really ruin your day if you aren�t. �����Each Mission begins with a briefing that includes the tasks to be performed, a map of the terrain, locations that you must go to accomplish your goals, alien strengths and other pertinent information. Of course if you read the Storyline you would already know this. �����You must return to base to actually complete a mission. None of that usual magic where you kill the last aliens and are transported back safely to home. No, you better have fuel or you are toast. �����Since you are deep inside a mine, you can use the miners� rail system. They aren�t likely to complain because you are there to save them. Just position your vehicle at the end of the rail and press the D-Control UP/DOWN to move. Press Forward Thrust at the end to disconnect. �����If you see a Support Pod or Support Capsule, lower your craft onto them to get their supplies. �����You might find unknown weapons that even Mission Control doesn�t know about. The A-Button allows selection of weapons, but don�t expect Mission Control to know about them either because but apparently the game designers didn�t know about them because they never described them. So select weapons at your own risk.